In Part 1 of my series I wrote about the third main between Westfield & Wiri as being an ATAP ASAP, a first decade project that in my opinion needed funding straight away. My second post of this series was about the need for extra trains prior to the completion of the City Rail Link. The third chapter is about a project that had kinda fallen off the radar, the Eastern Busway but specifically the Pakuranga to Botany section as opposed to the Panmure to Pakuranga section AT are looking to consent. In ATAP the project is listed as a 1st Decade Project, we haven’t heard much since June when AT made public the AMETI Sequencing Delivery Strategy for Panmure to Botany, which was likely in response to AT initially trying to defer the Reeves Rd flyover. That was to allow them to accelerate the Pakuranga to Botany section of the busway and add bus lanes on Pakuranga Rd up to Highland Park. Unfortunately, and in part due to political pressure, AT ultimately backtracked on the flyover, putting it back on the table and leaving a funding gap again for accelerating the busway. Completion of the Pakuranga to Botany Busway as early as possible. The intention is still for a median alignment busway for Stage 2b which is great. 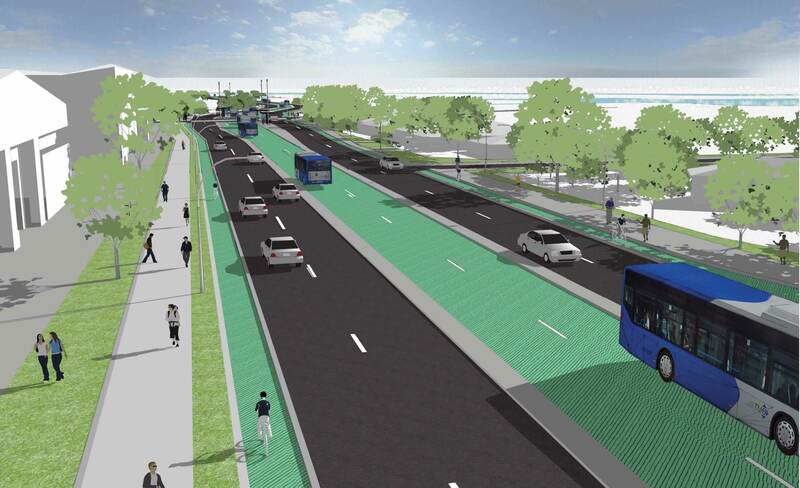 That bus lanes are being planned on Pakuranga Rd as far as Highland Park which is also great. Pakuranga Rd is an ideal candidate for bus lanes as is 3 lanes each with with slip/turning lanes/medians in sections so it should be a relatively easy from a infrastructure perspective to put in place those lanes. However, recently AT have put out a tender for the design/consulting of stage 2b. This project is a critical link needed in the development of our rapid transit network and alongside bus lanes to at least Highland Park, will be important in delivering vital PT improvements to an area that has very poor access to decent public transportation. It is surely is a prime candidate for central government to step in and fill the funding gap as for a small amount of the the NZTA’s expected overall transport budget. Perhaps the Government could announce a quick win for coming up the elections by being able to say the Eastern Busway is funded, as well as giving the community, developers and businesses confidence to get moving with the certainty the announcement would bring, just as they did last year with the CRL. AT need to paint some bus lanes on Pakuranga Road between Highland Park and Pakuranga Plaza, and on Ti Rakau drive now, to score some quick runs on the board. Would also serve to make locals get used to what future BRT will feel like. Good luck expecting this Govt to spend money in that electorate on PT with a 35% winning margin at the last election and a confirmed roadie as the encumbent. It would be great if they did, but I can’t see it happening. Actually, apart from been dragged kicking and screaming to perhaps commit to the CRL what has National done for PT in 9 years that is positive? And no, rejecting funding options for the rail electrification by making Auckland take on a half billion dollar loan was not positive. For AMETI – Can we add extenstions/upgrades to some of the existing infrastructure and add some new infrastructure with priority for PT? Carbine Road – A PT/Pedestrian only bridge linking from Panama Rd to Highbrook, providing PT another alternative route to connect Sylvia Park & Eastern suburb residents alongside Waipuna & Lagoon Drive. And also another Sylvia Park bus station running along the SE highway to take future pressure off AMETI running along Lagoon Dr. It would use the existing highway as is. Seeing as a new office tower is being built alongside the highway I reckon in future something like this could be considered? Not sure would work with 80km speed limit merging with almost motorway speed traffic? Are the Sylvia Park shopping centre expansion plan detailed designs already done around that space? Probably main thing is funding and/or other competing priorities sadly. All of these suggestions are west of the Tamaki River. AMETI needs to focus on the crossing of the river and infrastructure to the east of it. This is where the problems and decades of neglect are. This project has been called AMETI for so long now there is a very real risk that people will start to know what it means. Surely that suggests it is time for a name change by AT? If the plan is to turn this into light rail in the future, why not just skip the busway and make it a light rail from the beginning. Busway will reach its capacity in a very short time, just look at Northern Busway. It is not even a decade old and its near capacity. It will cost more to build a busway then rail later than directly railing the route. Also why would you want a major disruption in a route when it is very popular, where would all the buses go when the busway is close for rail construction in a decade? Its like closing the whole Southern Motorway from motorist for a year or two. Where would everyone go in the meantime? LR rail would likely cost more initially, which would put further out of reach of the budget – it’s a bit of a trade-off. Also there are likely to be buses that continue past Panmure and also joining the busway from Howick/Highland Park so it would need to take both buses and LR. I was keen on the thought of LRT immediately too (seen as this has dragged out so long), but unless you do all the way to Manukau and on to airport linking with proposed city to Dominion Rd LRT, it’s too short a run I think considering stabling costs etc. This would divert funding from the firstly important LRT route from Wyndard Qtr up Queen St. This is a real litmus test for AT’s commitment to allowing modal choice, they are not doing well so far. Agree, for all the talk about future projects like airport rail, harbour tunnels and Dominion LR, this is actually going to be the next piece of rapid transit. If it takes another 10 years then there is not a lot of hope. Correct. So we are now into stage 2. We are past arguing that quality PT infrastructure is needed, but how soon. Our role now is to accelerate these incredibly drawn out projects. They are principally so delayed because massive low value highways are eating almost all of the budget. So it’s fantastic that the politicians and institutions have now come round to our view on what is needed, now they also need be educated about the need for getting on with it. We will win this too. Once the path dependency of the institutions is broken, and crazy backwards pull from central government is fixed; it will be like a dam bursting. Mark my words. Cynicism in the meantime is not the approach. Agree, with your dam bursting analogy, and I think a lot is to do with the great work you guys do. I will reserve my right to cynicism though when I see a 2015 LTP with Panmure to Pakuranga being built from 2017-2020 and Pakuranga to Botany from 2021-2024. It’s clear that the first isn’t happening, but we can still hope maybe that they both end up being built at the same time. Can you please clarify what Stage 2b actually consists of? oh found it: “…Stage 2b is the Pakuranga to Botany busway”. I’ve been catching the bus between Farm Cove and Newmarket recently and the time it takes to get along the Pakuranga highway to Panmure is horrific. No wonder everyone drives! Bus lanes are needed stat. Ameti is a land and house gobbling screw-up. Bus lane Pakuranga and Te Rakau now. Of course there will be car congestion. That will make the buses more attractive. Carrot and stick, not a whole feast. Long term investment in this corridor needs to be light rail, with minimal removal of houses. Elevated sections of light rail between Pakuranga Plaza and Panmure would have much greater social and transport benefits than the Ameti boondoggle.